What is a pop-up? A “pop–up shop” is a short-term, temporary retail event that is “here today, gone tomorrow”. Pop–up retail is the temporary use of physical space to create a long term, lasting impression with potential customers. We are collaborating with the amazing girl bosses over at Moonfish for a one-of-a-kind pop-up event at The Loft! Our office started off this week with a bang! The entire office teamed up with our friends from Moonfish for a fun filled, adventurous, and exciting photo shoot featuring their spring 2017 line. Each of our team members got an opportunity to have a sneak peek into the collection. We sampled and modeled some of the pieces you can expect to see in the lineup. Not only are the owners of Moonfish, Cathy & Sarah, the nicest and the most creative business owners to work with, their photographer Patricia De LaRosa could not be better to work with and has amazing vision! We are happy to announce that our facility will be hosting a pop-up shop for Moonfish is 2017 spring lineup on March 10 through the 13th. We would like to invite all of our patients, all of our followers and their friends to this event here at the loft. More exciting news! At the end of the month, on January 31, our office drew the winner of our Beverly Hills Hotel sweepstakes. For those of you who have been following, this campaign has been ongoing for a few months. Over the course, we’ve gathered many great candidates for this trip. We are so appreciative and thankful of everyone who entered and everyone who has ever stepped foot inside of our practice. But of course, there can only be one winner. This name will be announced once we get the chance to tell this person “in person.” We are extremely excited and cannot wait to share the news with them and you! 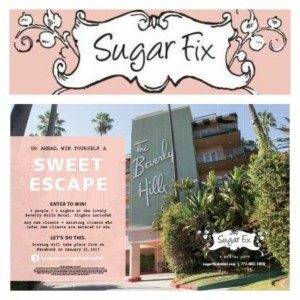 It can’t be ALL play at Sugar Fix Dental Loft. Of course, Dr. Jessica Emery still treated our wonderful patients this week with same-day restorations and cosmetic consultations. Duty calls and we wouldn’t have it any other way! Lastly, Sugar Fix Dental Loft would like to wish Callie Klinger, RDH, nothing best the best to her and her family in their future endeavors. She was a delight to have in our practice and know only great things are to come for her! That’s it for now. On to the next 6 weeks of cold weather (per Punxsutawney Phil) and the best month of the year, February!